This past Sunday, March 4, we finished the final of seven Deanery Vestry Dinners at which the vestries of all eight of our deaneries met with their bishop and clergy. Hundreds and hundreds of people attended these evenings of good food, dialogue and fellowship, which were marked by candor and hope. 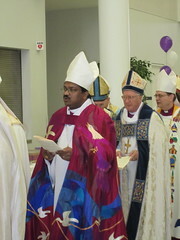 Out of these gatherings we affirmed the four goals of my episcopate, which I have shared with you before. I now want to expand on these as we go through the Lenten season and into Easter. The parishes and their well-being are my highest priority. Part of my job as bishop is to come to know our clergy and laity, to listen carefully, and to weave all the voices of our varied congregations—some liberal, some conservative, some moderate—into one tapestry of faith, in order to foster coherence and unity. So to do this I must be present in all of our churches as often as possible, and to know as many of the people of the diocese as I can. About to set off in again my red Prius. And so this is why in one year in Western New York I have put 18,000 miles on my Prius. I have been and will continue to be out and about, not only for Sunday visitations, but also for fish fries, barbecue dinners, fund-raisers, Fourth of July parades, to give lectures and retreats, to conduct special services, and attend parish events of all kinds. This is a spiritual joy for me, and it also happens to be a lot of fun. Three figures in particular have inspired my concept of the bishop’s role. One is Chad, a British bishop of the seventh century, whose feast day we celebrated on March 2. Chad, like me, had something of a reputation for the irregular speed at which he got around. A beautiful Recption at Trinity, Warsaw. Chad was trained by those who followed the Celtic rather than the Roman traditions of spirituality. Impressed by Chad’s qualities, the King of England appointed him Bishop of York. Following apostolic example, Chad constantly traveled about his diocese on foot. As a runner and walker, I like that. Theodore, a new Archbishop of Canterbury who had been educated in Rome, arrived in England four years after Chad’s ordination as bishop. 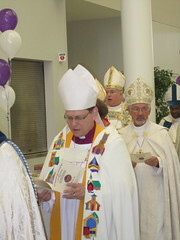 He made it clear that Chad’s ordination had been irregular and reordained him according to Roman custom. He then appointed Chad to a much larger diocese, Mercia and Northumbria. Chad insisted on continuing his custom of traveling around the diocese on foot. This was too slow for the Archbishop, and he ordered Chad to ride and to ride fast. When Bishop Chad refused, the Archbishop is said to have lifted him bodily onto a fast horse. The great historian the Venerable Bede wrote, “The Archbishop was determined to compel him to ride when the need arose.” Speed was necessary to fulfill the example of the apostles, whose successors bishops are. As our Prayer Book says, a bishop’s job is “to be one with the apostles in proclaiming Christ’s resurrection and interpreting the Gospel, and to testify to Christ’s sovereignty as Lord of lords and King of kings.” But, presence does not mean just preaching to people. It means actually getting to know them. Confirmation Class at St. Mark's, Orchard Park. A second figure who inspires me is an Italian bishop I met several years ago. I had gone to a small, rough Italian town south of Naples to give a lecture. After the conference, this bishop invited all the speakers to a closing dinner in a rather shady section of that Southern Italian town. When we left the restaurant at about 1 in the morning, a large group of heavily pierced and tattooed skinheads on motorcycles were gathered in the street. As we walked toward them I was afraid. Suddenly, the skinheads all called out to the bishop, and he walked over to them. He knew all of their names, and he embraced them. You see, as young boys they had all been acolytes, and the bishop had gotten to know them in his parishes. It was quite natural for him to call them each by name. I am also inspired by the Apostle Paul. Paul traveled constantly over Asia Minor and into Europe visiting and revisiting the spiritual communities he had founded. When he could not be with them, he communicated to them in the medium of his day—the letter. Now I follow his example using the media of the 21st century—this blog, Facebook and e-mail. Though the media through which we humans communicate has changed, the Good News has not. And I have been repeating it over and over at every parish stop: God has a plan for us and because of God’s grace through Jesus Christ, which we encounter in the Eucharist, in God’s Word, and in God’s community—the church, we can change. And because we can change, we have hope. Our mission is to share this hope with all the communities that comprise Western New York. “With all wisdom and understanding, he made known to us the mystery of his will according to his good pleasure, which he purposed in Christ, to be put into effect when the times reach their fulfillment–to bring unity to all things in heaven and on earth under Christ. “In him we were also chosen, having been predestined according to the plan of him who works out everything in conformity with the purpose of his will, in order that we, who were the first to put our hope in Christ, might be for the praise of his glory. Well said, Bishop Franklin. The ministry of your presence, as often as possible, in our parishes and at the Cathedral, is so important because it gives all of us a chance to get to know you better, and to become “the necessary pieces of the puzzle” needed to complete your plan for the Diocese, and the Web of Grace. As an aside, I have a 5-year old Corolla with only 16,000 miles on it! I can’t hold a candle to you and your Prius! Thank you, Judy. The support of you and others around our diocese means a great deal to me. I believe all of us thinking, praying and working collectively will result in so much good. 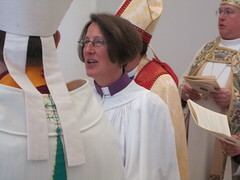 I look forward to beginning my ministry at the Cathedral and being present with Dean Liza and the people of St. Paul’s. I am keeping you in my daily prayers . Ps. I was going to send you some pictures of that church. The ministry of that church has been amazing forever.